America’s former ambassador to Turkey, James Jeffrey, once noted, “you have to deal with the Turkey you have, rather than the one you’d like to have,” underscoring the importance of America’s critical Middle Eastern ally regardless of its leaders’ ideological leanings. The Trump administration, despite the challenges it and the American people have encountered thus far, appears to have heeded this advice. Considering the lack of consistency in the foreign policy it has articulated over the past few weeks, it is worth remarking on the administration’s activity in this area. In meetings in Brussels and Ankara this week, the Trump administration has sought to mend America’s partnership with Turkey, after relations became increasingly strained in President Obama’s final months in office. The Obama administration, despite its reliance on Turkish collaboration in Syria, showed little love for Turkey’s authoritarian president, Recep Tayyip Erdogan. Erdogan has seen evidence of a waning U.S. commitment to his country in a number of developments over the last 12 months, such as Obama’s delayed support following an attempted coup in July, his “failure” to extradite exiled cleric Fethullah Gülen on charges that he orchestrated the botched putsch, and America’s continued military support for the Kurdish People’s Protection Units, otherwise referred to as the YPG, in northern Syria. According to leadership in Ankara, the YPG is a terrorist organization with close ties to the Kurdistan Workers’ Party (PKK), an armed separatist movement that has been in conflict with the Turkish government since the 1980s. As this publication has noted, the Obama administration vocalized its concerns surrounding Ankara’s crackdown on alleged political operatives of the “deep state”, suggesting that Erdogan’s reactionary political reforms and repression of dissent pose a greater threat to democracy than the coup itself. Deepening mistrust and frustration have since been the hallmarks of Turkish-American relations. Looking ahead to the following administration, Erdogan repeatedly commented that he hoped that the points of disagreement in the bilateral relationship would be resolved under Trump. Looking into the second month of the Trump presidency, headway has already been made in bridging past divides: realpolitik has trumped the humanitarian and social justice concerns that caused tension during the Obama administration. 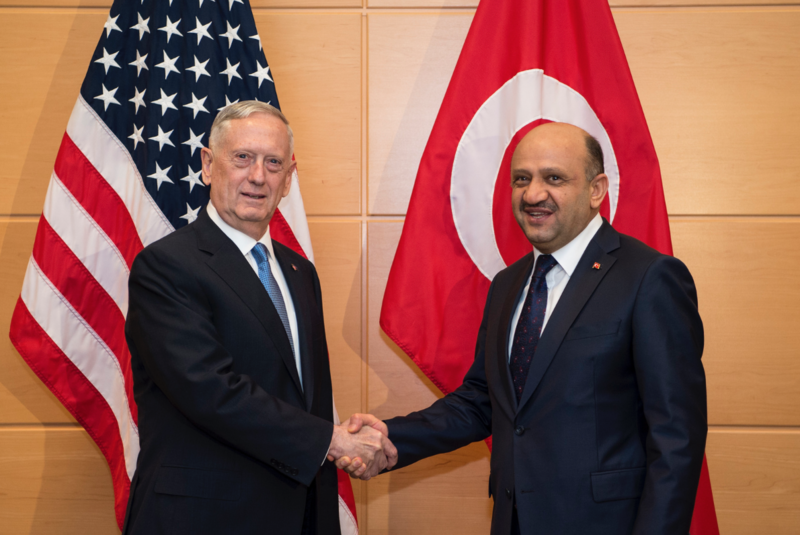 At the NATO Summit in Brussels this week, U.S. Defense Secretrary James Mattis, pledged increased American support for Operation Euphrates Shield in a meeting with Turkish Defense Minister Fikri Işık. For nearly six months, Turkish forces have sought to clear the border between Syria and Turkey of terrorist operatives in order to maintain border security, simultaneously clearing the area of Kurdish “militants” so as to prevent Kurdish groups from establish control over territory they have long sought. Among other things, the pair discussed the ongoing civil war in Syria, their predictions regarding talks in Astana, and expressed hope that further dialogue would help mend cooperation between the two states. Specifically, the NATO allies speculated whether a possible joint operation to reclaim Raqqa would be tenable, with Turkey preferring such an approach to relying on the YPG to sweep ISIS from the area. Such planning is a dramatic departure from the previous administration, which vehemently opposed deploying ground troops in Syria. Although purely speculative at this phase–and likely to be met with opposition stateside–the deliberations have reassured Turkish leaders. Although Işık condemned U.S. support for YPG forces, stating that “one terrorist organization cannot be preferred to another one”, Mattis made note of how the YPG has served as a key ally against ISIS in Syria. Turkish media has speculated that the U.S. intends to cut YPG support entirely–a dramatic interpretation of events. Washington has dismissed these claims quietly so as not to dampen the Turkish domestic reaction to U.S. talks. Despite this bit of friction the talks were constructive, signalling the pair will be working closely in the coming years. U.S. Chairman of the Joint Chiefs of Staff, General Joseph Dunford, also met his Turkish counterpart this week in Ankara, the first high-ranking U.S. official to meet with Turkish staff. CIA director Mike Pompeo has also arrived in Turkey, amidst news headlines proclaiming that Trump “is coming for Raqqa” or is “coming for the Free Syrian Army”. Even tabloids have highlighted the significance of Washington’s heightened displays of commitment to Turkey and stability in the region. As noted by former Ambassador Jeffrey, “by body language and the ‘anybody but Obama’ factor Presidents Trump and Erdogan could hit it off personally.” Yet mending strained ties can only be achieved through “accommodating each other’s core regional interests; for Trump, destroying IS and containing Iran; for Erdogan, more US action against Gulen and more care dealing with the YPG.” This is no easy feat. The Pentagon has already invested heavily in Syrian Kurdish forces, making compromise in this area quite unlikely. Furthermore, it is unrealistic that the United States will be willing to breach international law in order to assuage tension surrounding Gulen; these two glaring points of friction will not be entirely resolved. However, confidence-building displays of commitment will suffice for the time being and will prove invaluable in strengthening the alliance. It is in the American interest to salvage a partnership that was slowly falling apart, preventing a further Turkish pivot towards Moscow. This week world leaders and other elites convened in Germany for the Munich Security Conference. One point of discussion will be whether we are now entering a “post-Western age”. Although such speculation is beyond the scope of this piece, the rise of populism has shaken the balance of international order, threatening to turn countries inward and to push states towards abandoning long-enduring commitments and working relationships. A potential U.S. retrenchment from global affairs would be a highly disruptive change to current international dynamics. Displays of commitment and proposals of increased support–moral, material or merely speculative–are necessary, especially among states which have felt target or isolated in recent years. The Trump administration has certainly attracted considerable media attention surrounding its latest string of gaffes. Defense officials should receive similar attention for their efforts to rejuvenate America’s image and partnerships abroad. Kathryn is in her second year at McGill pursuing a Bachelor of Arts in Political Science and History. She is most interested in international politics, trade relations and Turkey’s increasing geopolitical importance.